What is the big picture of your refereeing career? Are you just enjoying your games every weekend or do you want to get more out of it? If you want to achieve your goals as a referee, you need to answer this this question for yourself. The last week of 2017 is a good moment to start looking forward. In a blog series on goal-setting I’ll give you some effective tips to get you started and keep you motivated to work on your goals all the time. 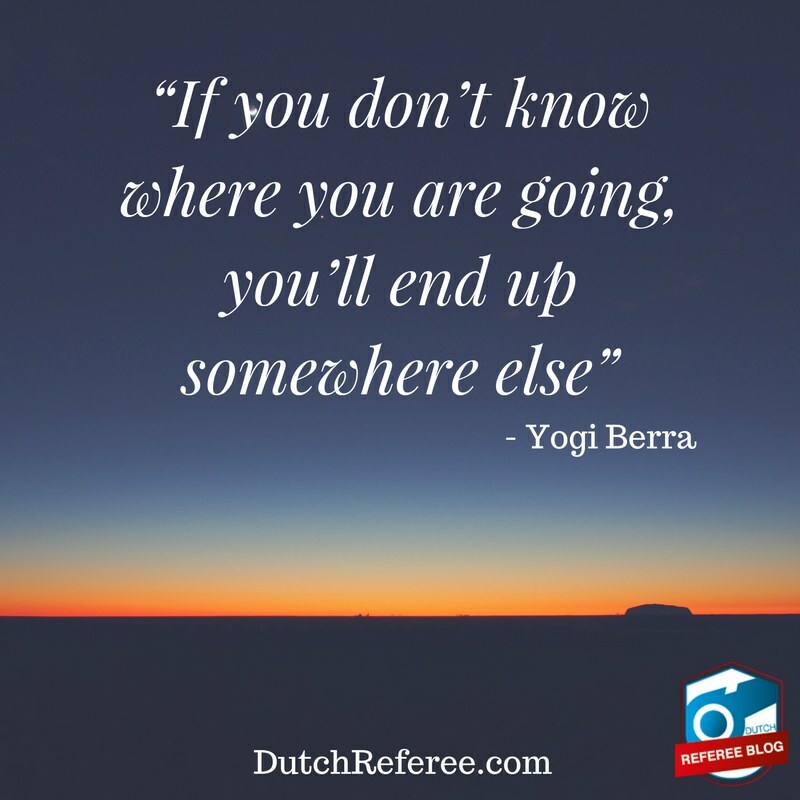 “If you don’t know where you are going, you’ll end up somewhere else” – Yogi Berra. A great quote from a former American Major League Baseball catcher and coach. It applies to everybody – whether it is at work or in sports. That’s why it’s so important to define your ambition as referee. What do you really want to achieve? In a following blog post you’ll read what the principles are for effective goal-setting. But the key thing for that is: think about what you really want to achieve. You need to set some time aside for yourself. Allocate some time for yourself when you will have plenty of time to think freely without distraction, whether that is now, before you go to work or college during your breakfast or maybe after you had dinner. Do I want refereeing to only be my weekend hobby that helps you get rid off stress from work? Is officiating a local cup final my dream and is that good enough for me? Do I want to officiate the national cup final? Or do I want to officiate games in a FIFA stadium? It’s very easy to think: I want to reach the World Cup final. In my dreams I see myself refereeing recent World Cup finals instead of Howard Webb or Nicola Rizzoli. You will do that too probably. But is it something you really want? A second question you need to ask yourself: WHY do I have that ambition? It sounds odd for many people: write down your ambition and why you have that ambition. You might think that now you’ve thought of it, it’s stuck in your head. The big picture of your refereeing career will fade away. And remember the quote I mentioned at the start of this blog post: “If you don’t know where you are going, you’ll end up somewhere else”. Now you’ve got some work to do. Take some time to of the big picture of your refereeing career. Gerry Duffy wants to inspire you to think bigger, take a different approach. That will help you to better shape your big picture. When that’s done, you’ll need to set some real goals. Check out Gerry Duffy’s story. The third blog post will make sure you will do that the right way to make it most effective.